A glorious, sunny Bloom Day found me with a few minutes to take pictures but not quite enough time to post them, so here I am a day late with my report. 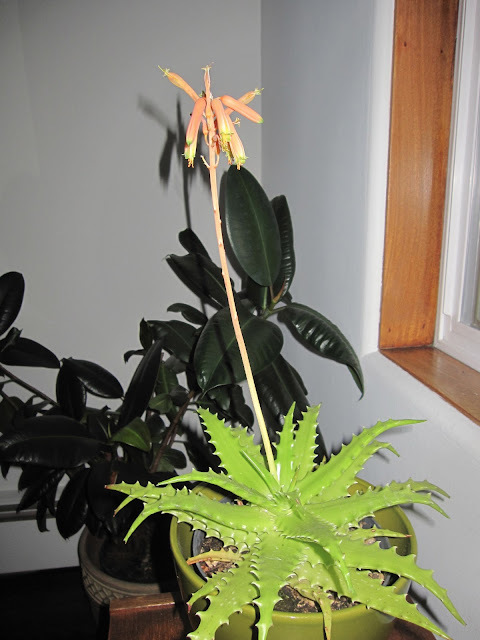 Aloe dorotheae, with no orange left in her foliage, but a fleeting and welcome orange bloom. Outside, the tiny flowers in a planter full of Sarcoccoca hookeriana var. humilis perfume the air and attract bees. If you don't have room for the larger Sarcoccoca, this one is a good smaller choice. Rosemarinus prostratus 'Bonny Jean' in another front garden planter. Daphne odora 'Marginata' - one flower cluster has just opened in time for Bloom Day. And the soft pink urn-shaped flowers of Arctostaphylos x 'Austin Griffiths' are just opening as well. The astounding Camellia sasanqua 'Yuletide' keeps pumping out blooms. I saw lots of these featured at the recent Yard, Garden and Patio Show - it's no wonder! I'm signing off this post with the hope that you visit our host Carol, at May Dreams Gardens, to enjoy a look at lots of other bloomers for February. 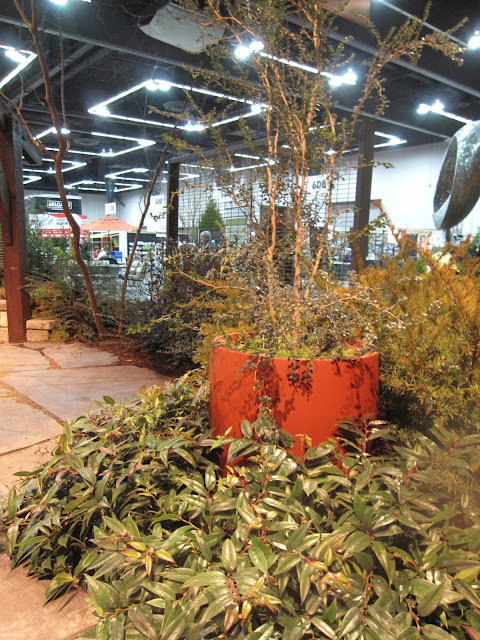 This year the Yard, Garden and Patio Show was earlier than usual. And that was great with me. The YGP is my personal (but completely unofficial) end-of-winter marker. You know, that part of the year where we barely go outside into the garden. Done with that! I'd be hard-pressed to decide which is the stronger draw for me - the speakers, or the actual show with its plant information, display gardens and plants for sale. But luckily I didn't have to decide, since this local event is all things wrapped up into one. On Friday, I heard Sean Hogan discuss Best New Natives for Design (yes, arctostaphylos! ), Dan Hinkley spoke on Noteworthy Trees, Shrubs and Vines for Pacific NW Gardens (many in the pipeline from Monrovia soon), and Maurice Horn made a compelling case for some overlooked Perennials and Shrubs of Merit for Northwest Gardens, including a favorite of mine, Cistus obtusifolius. Although I wasn't knocked out by any of the official display gardens as a whole, I really enjoyed the color and contrast presented in some of the plant combinations and materials. Where color was more muted, texture and pattern contrasted. Hammamelis x intermedia 'Arnold Promise' figured prominently in multiple gardens, as did Camellia sasanqua 'Yuletide'. 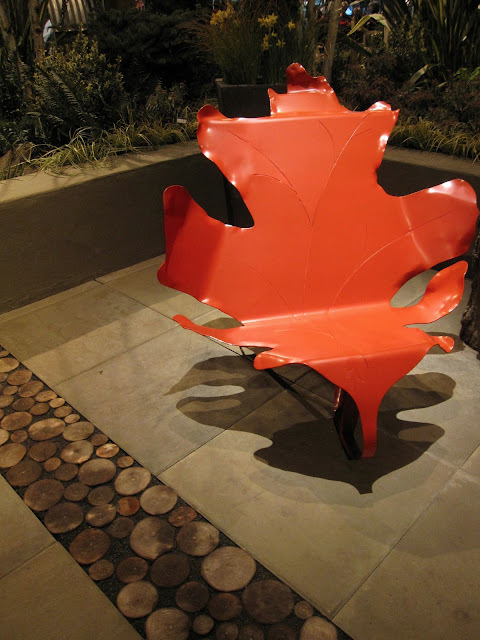 Seating solutions were creative, inviting and often colorful. The photo above leads us to my favorite garden of the show, and it wasn't even a designated display garden. The Urban Edible Garden had so much going for it. Simple, clean, open, but with great places to grow lots of plants, not just veggies. Yes, that is a child-sized nest you see above and below - complete with child. I loved the curving steel and the long narrow pavers in this garden. Of course there were chickens: we're in Portland, people. And a number of raised beds. I came to understand my need for an exterior sink on a beautiful natural plank counter. With planters on the wall behind it. This garden satisfied on so many levels. 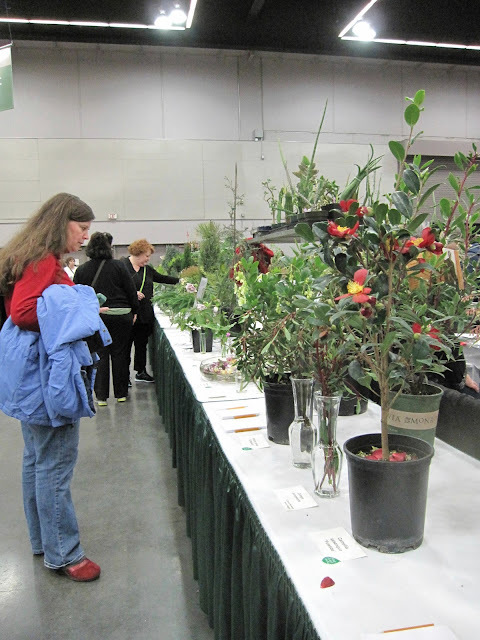 The Hardy Plant Society had tables full of winter and early spring interest. ... I only came home with two plants. I was on foot and didn't want to traumatize them too much. Two of Xera's Iris x pacifica 'Meadow Pastels' will grace the Northwest territory this summer. And now that I'm revved up, it's on to the Northwest Flower and Garden Show in Seattle in just a week! I'd like nothing more than to see my agaves in the ground. 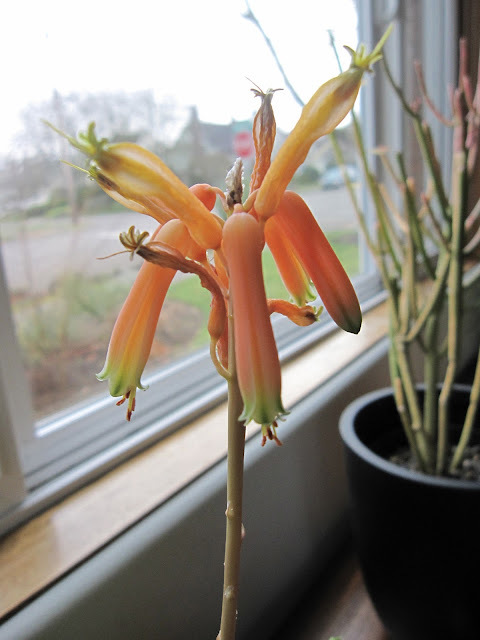 I know some of them can (thoretically) make it through our Zone 8 Portland winter. But I'm too much of a novice at growing them, and I'm not willing to risk their little spikey lives to the icy Columbia Gorge winds we usually get at least once each winter. So for now, they live in pots that can be carried indoors in autumn. We have a nice south-facing exposure with a sliding glass door, and even a bit of floor space to accommodate them. But they don't really like being indoors, and they need water and a little cleanup several times during their incarceration. I was doing that yesterday and that's when I discovered the pups. Lots of them. 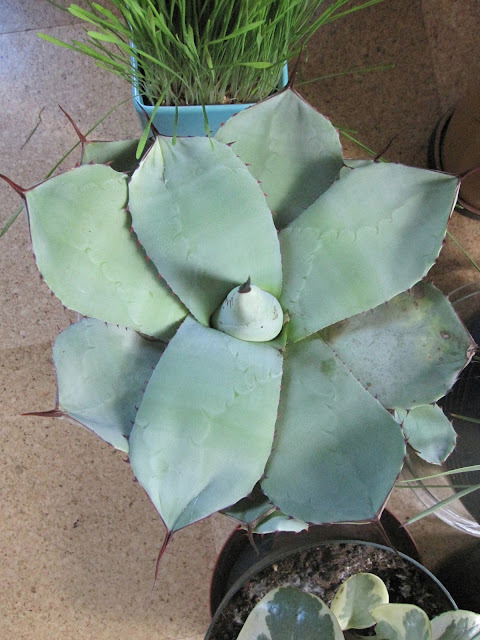 This is Agave parryi 'Cream Spike'. I knew it was a prolific offsetter, but it surprised even me with its speed this time. Three pups are already growing alongside the mother that I repotted just this past summer. The third pup is the largest: it's lodged right beside the mother and is hard to see under her flat leaves. Agave titanota is jammed into a very narrow pot but that doesn't seem to be hurting it in the pup department. Wait, maybe I've discovered the secret to inducing self-propagation. My Agave geminiflora surprised me with a hard to see pup. Can you spot it leaning out to the left from the mother? Agave parryi var. truncata is being taken over by several robust pups. They seem like small gray-green parasites that could devour the host if they're not removed soon. There are the tougher agaves I haven't risked outdoors yet either, but I know they are good candidates for wintering over in well-prepared beds. Maybe this summer I'll risk it. These agaves start out offsetting with a bang and are just getting bigger over winter indoors. Here's Pearl showing us an excellent use of an agave spike (if you're an itchy cat.) This Agave scabra pup survived indoors while its poor mother that I ignorantly planted in the ground several years ago died a slimy winter death. The "pup" is now larger than the mother was. Which appears to suit Pearl just fine.